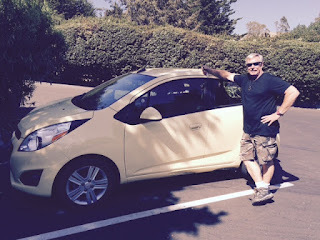 Tracy and I headed off to sunny California in search of sun, sand, wine, food and perhaps surf. We are super fortunate that Aunt Sue was able to come and stay with the kids so we could get a few days of R&R..
Sunday afternoon we headed to the coast, watching our own movies on the plane, enjoying some quiet time at 30,000 feet and since we booked our tickets with world perks points we also we treated to a cocktail and a snack, righteous way to start the trip! We landed, found the rental car agency and check out this albeit compact very cool efficient Chevy spark, in a carny yellow then headed in San Fran. We strolled all around the area, Union Market, Hyde street, had a couple of stops for an appy and a drink at some eccentric San Fran pubs and finished the night at a Creo/New Orleans jazz club/ soul food place called Tupelo. Their smoked collard greens, yes smoked, were awesome along with the blackened catfish, red beans and rice were out of bounds but the trip to flavor town was all about the fried pickles!!! Monday we found the work out room and then headed off to Bodega Bay. We may a stop in Sausalito and wandered around there for a couple of hours. We found small family run Italian deli that inspired us to have a road side picnic, however between Sausalito and Bodega Bay there are no picnic stops so we had to settle on a lunch at the Marina in beautiful Bodega Bay. The town is relatively small however the beaches are really cool and the atmosphere is total California. The Sonoma Coast Villa and Spa was our home for the next 4 days and was just perfect. The first two days we were the only guests, super quiet and comfy! Our Innkeeper was an efficient German dude, not real outspoken but spot on with the breakfast options and printing out our boarding passes. The area is hilly, coastal, old trees with long vines, sleepy hollow kind of place. We received a complimentary bottle of champagne with our Groupon and the Spa had wine tasting from 4:30-5:30 so we opted to save the champagne and head out to the lobby for a bit of local red only to be informed that since we received the champagne, no wine for you, again the German efficiency coming out.That night found us at a very local, third generation run family style Italian joint, think walls lined with old booze bottle colorfully decorated ,wall to wall figurines,uneven floors, a menu to die for this is : Dinuccis Italian Dinner. The entrees were not for a mere mortal so fortunately they offered a minimum $7.00 plate charge per adult. Tracy ordered the soup and salad, $7.00 , Tom ordered the $24.95 porterhouse steak which came with, soup, salad, antipasti ,bread basket and a 16 oz., steak. The soup was house Minestrone and there is really no way to do the soup justice it was and is simply the most outrageous Minestrone on the planet totally out of bounds. In fact we couldn't finish all that they gave us so the waitress went to back it up and came back with a quart container and said, " I topped her off for ya" ( well in the California version of that). The rest of the wineries were small local wineries where they only sell the wines at the winery. They were all really interesting and different and all have something different to say about winemaking, I will not nerd you out however going on a tour is a must. Homewood, Ty Caton and Nicholson Ranch rounded our tour. Since we were in California we felt the need to find a Mexican place and experience some down home Mexican food. The small town on Petaluma is right between Sonoma and Bodega Bay and we found Mi Pueblo, a small little place offering up real deal Mexican. Fresh veggies marinated in an adobe sauce, fajita's with fresh corn tortilla's and a balk bean bonanza, we left with a to go back of fajita fixings, and a happy tummy. Wednesday was all about the sand, hiking, surf and leftovers. We hiked along the coast for about 4 miles then headed over to one of the local beaches to have a picnic lunch, watch the sufers, read books and just chill. It was a bit on the cool side but we still managed to get sunburned while out and about. Having ventured into the thriving town of Bodega, a mere stones throw up the street we found a few interesting tidbits, this little town was where Alfred filmed many scenes from the Birds as well as they have a really old cemetery and a killer bar/restaurant called the Casino. The place is straight out of hippey meets Ralph Loren/with a homeless surfer vibe, quite crazy. They take only cash, have no on hand chef but feature rotating floater Chefs that come in different nights of the week, make a couple of appetizers, two antes and a dessert, we lucked out on Wednesdays nights these two women from down the coast come in and make killer Padron Peppers and the best banana cream pie. The crowd ranged for a suffer type dude with no shoes to Chartreus Micro bus full of Hippies, a couple of college trust fund kids to two Grandmas chugging down the last of their bottle of wine, kids running around, a man and wife completely decked out in camo - he even had the prerequisite chew can mark in his back jeans pocket, total fun. The main course was a chicken with a caper and bacon cream sauce, killer rosemary potatoes, Tracy had pork chops with steamed and then roasted garden veggies and also stole a really yummy buttermilk biscuit from Tom, the whole presentation was totally spot on. Thursday we headed back to San Francisco and headed home. We had a fun flight back and got to watch The Maze Runner together it was a great way to finish our get-a way! Friday we packed up the pilot and headed up to Cross Lake for a weekend camping trip with or friends the Orevdahl's, a great fun family. Doug and Jennifer have three boys, James who is Jimmy's age and Sam & Sean twins who are between Kay and Billy all the kids and parents a like get a long great and the weekend was no exception. We rolled in after a lunch stop at Buffalo Wild Wings, also known as Bdub, set up camp go organized the headed over to the Bait Box to pick up our transportation for the weekend. We were lucky to get the last boat for the weekend, a 1988 25' pontoon boat with only lawn chairs for seating and a fixed Bimini top, we were all set! Friday we explored the lake for a bit, caught a bunch of fish, of course Kay caught the first, the biggest and the most fish but everyone was in on the action! There is a boat up Supper club on the lake called the Warf, and we headed there for dinner. The fare was typical supper club and with the kids chicken stripes and fries were the main choice, except Kay who went after the Lobster Bisque, which was out of bounds good. A bon-fire, s'mores and the telling of riddles and funny stories ended the first night. Saturday was exploring the campground and then out on the boat. The kids had fun fishing, jumping off the pontoon and swimming around but the main attraction was wave jumping (or really diving). Yep Tracy at the helm found the big waves from the newer era power boats and we hit the waves head on. It was not really wave jumping more front end diving with the waves pounding into and over the kids soaking them in the process! We kept at it for sometime until one set of really big waves took the nose down below the surface and we almost lost a kid or two, time to head back. The Riverside Supper club was our host for Saturday night and did not disappoint. Tired, sore and ready for bed we headed back to the campground. the kids were looking forward to getting back to school as well. A great weekend and super fun trip....more to come.